I cannot tell you how tempted I am not to put pictures up of my yard, because it's a complete mess. The previous owners covered the entire yard with rock, but they didn't put plastic underneath it for the entire back yard. 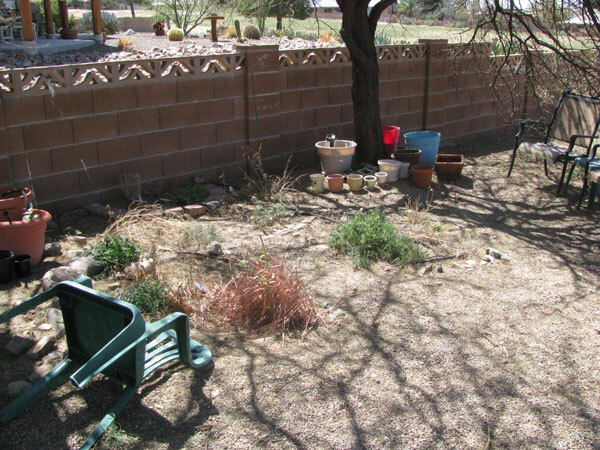 This has left us with a yard that, over the years, has become a rocky, weedy mess. 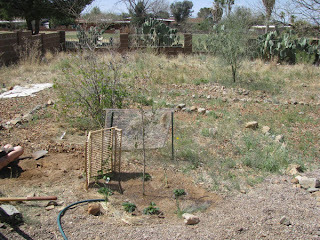 It's not pretty, although the quail, the birds, and the rabbits are fairly happy with it. The rattlesnakes were a bit happy with it, too, until I put up some wire to block the two main entrances to the backyard. To be honest, I wouldn't normally care if they came and visited (less packrats for me to worry about!) except that the two rattlesnakes who came by seemed enamored of the spots underneath the chairs where the kids sit outside. Not good. But anyway, the yard. It's not great. There are some spots I'm really proud of, but they are tiny, and not noticeable to most people who are blinded by the weeds and rocks right off the bat. however, I don't think I'll really appreciate the yard 'after pictures'(pleeeeease turn out awesome, yard, I'm begging you!) unless I get a true and honest 'before' picture. So here's my yard's before pictures (some of them, anyway), complete with yard curlers, slippers, and green goop over my yard's face. This is what I call the herb garden. 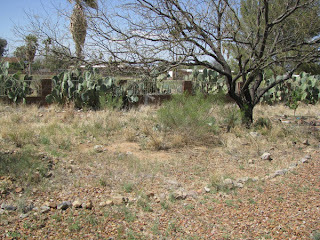 It's set between two mesquite trees which give it quite a bit of shade, more than anywhere else in the yard. We got an unusual amount of snow this year (it snowed three times, which is really rare) and that stomped some of my more tropical plants, like the lemongrass. A lovely windstorm has knocked over my little plastic chair. And while my herb garden was awesome when I first put it in, it's been struggling more and more over the last couple of years. A friend was reading about mesquite trees recently and came across the information that mesquite tree roots can, after a while, sometimes grow back UP toward the surface to get more water. I have not confirmed this, but it might explain why my herbs seem to be struggling more and more these last few years, and drying out quickly no matter how I water them. In any case, I am abandoning this site as an in-ground herb garden for the most part and working on setting up potted plants to take advantage of the shade without having to compete with the mesquite trees. This is what I refer to as the 'wall garden.' Yes, I'm extremely creative with my names, what can I say. 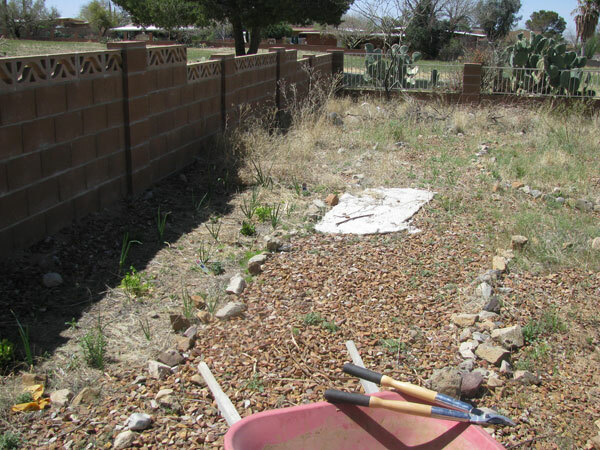 The soil is poor, and it took forever to just get the rocks out enough to garden here. 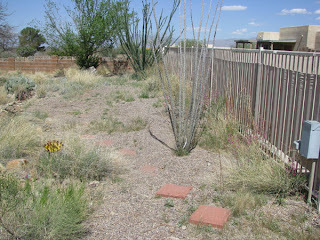 About a quarter of the garden is always shaded by the wall, which can help in some ways and is not so good in others. I keep trying to find the right mix of plants that will work in this area. The little white rectangle you see in the distance is a piece of left over carpet that is an easy way to kill weeds along the path if I leave it there a while. 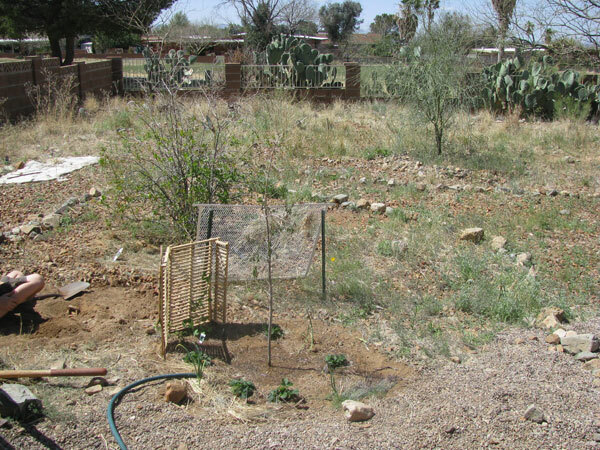 The garden is a bit bare right now as I was ill during the fall planting season Here in the desert you can plant cold weather crops in the fall and harvest year round. Kind of awesome. But this garden is just starting off after having been essentially fallow for 6 months. I don't tend to plant a ton of one type of plant - I companion plant the crap out of this, and I also like to mix and match. 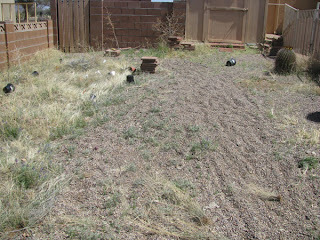 This particular garden has herbs, onions, lettuce, spinach, and radishes that seem to be coming up. I'm curious how well it will do. It may be too late to get much - the weather went from below freezing up to the 90's in a three week span, so my planting schedule has been hugely accelerated...as I pretend to actually know what needs to be planted. I don't. I fake it well and read labels and gardening websites and hope like heck I don't miss something! The lovely weeds in the background there are part overgrown path, part garden-I-haven't-dug-out-yet and part 'natural area' I want to plant native edible or medicinal plants in. There two are right next to the Wall Garden. The Pomegranate garden is an area of rock that I am frantically trying to dig up to plant a garden in this spring, next to the pomegranate tree. I'm trying a trick of planting a cut off branch from the tree in the ground to see if it will grow another tree. Sometimes it will, I'm told, and I had to cut the branch off anyway, so why not try, eh? 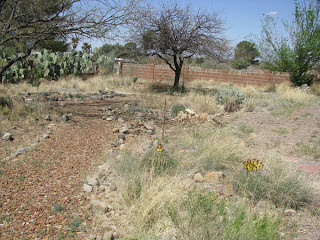 The nature Garden is a place where I need to eliminate the rocks and look at what native plants to put there. I've had some seeding mixes dumped in there but they never seem to take well, so we'll see what we can do in the future. 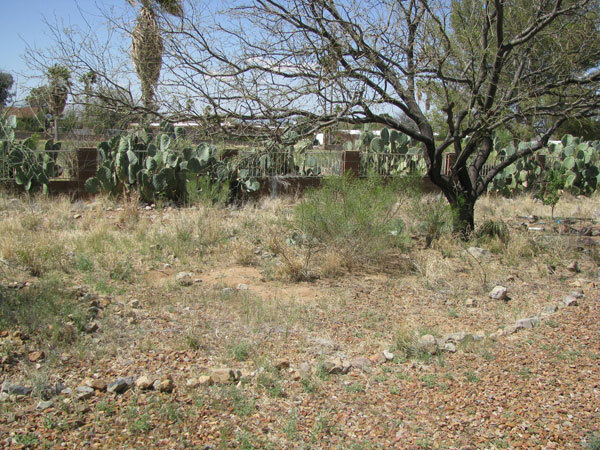 There is an almond tree, small, hidden along the left side of the first picture - you can barely see it there, because it is not even as tall as the cactus. 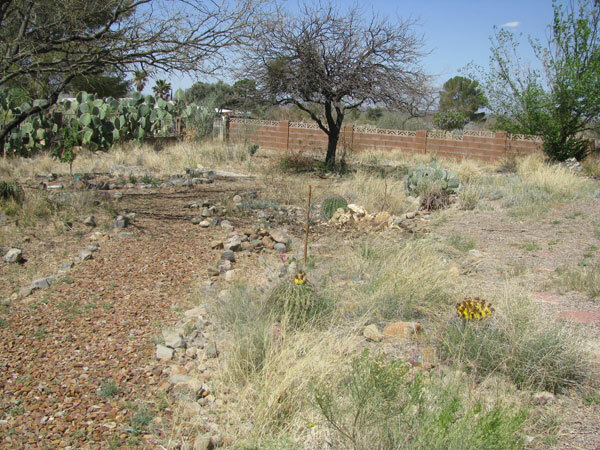 That area has a bit of soil dug up for a garden, the rest of this area has weeds and rocks, mostly, which I need to take care of. As you may have noticed, I DO have a lot of yard. There is 1/2 an acre, if you count the front and back, so there's a bit less than 1/2 acre in the back here to try and set up. On the opposite side of the yard from the wall garden is the Summer rains garden. All that lovely grass there on the left is because the water all flows down that side of the yard so last year I started trying to channel the flow a bit. The grass really enjoyed it, more than the wildflowers that I'd rather have, although they are there as well. 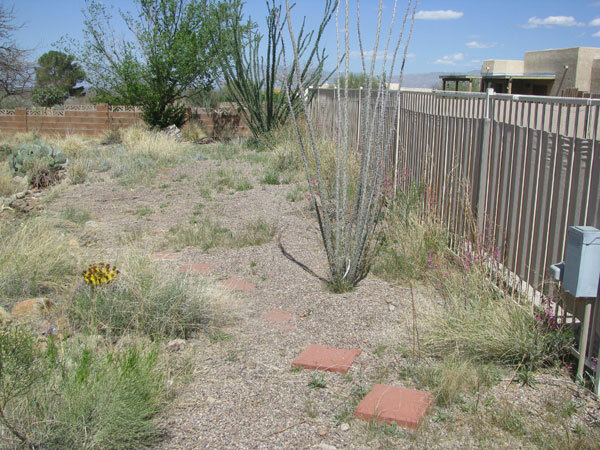 I'm hoping to clear it out a bit and put in some food plants that are desert hardy and that I can use the monsoon season summer rains to take care of most of the watering for.